Are the stats that Albert Pujols put up from 2001 to 2010 the best first 10 seasons in history? 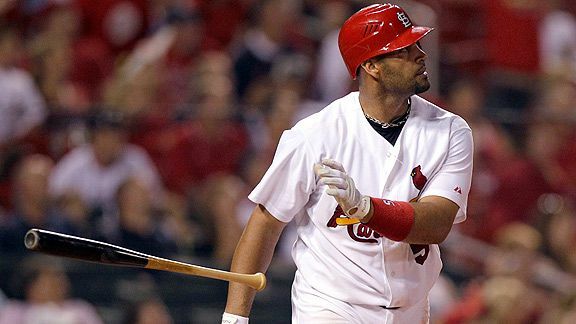 The noon ET deadline has passed for Albert Pujols and the St. Louis Cardinals to reach an agreement on a new contract. Does this mean that 2011 definitely will be Pujols’ last season in St. Louis? No, but if it is, then the Cardinals will be losing the services of one of the greatest players in the history of the game. In fact, if you look at Pujols’ numbers from his first 10 seasons, they are absolutely stunning. The case can be made that Pujols has had the best first 10 seasons of any player in MLB history. • One way to look at a player’s contributions (including pitching, hitting, base running and defense) is to look at his wins above replacement (WAR). This measures how many more wins a team had with the player in the lineup than they would have had if they had to replace him (taking into account his position). Baseball Reference has numbers that go back all time; however, the numbers are more estimates than actual the further you go back because of the lack of available data. According to Baseball-Reference.com, Pujols accounted for 83.8 wins above replacement in his first 10 seasons, second to only Ted Williams among position players. Pujols’ total already is tied for the 31st-highest WAR among position players, and tied for the 47th-highest WAR if you include pitchers, as well. • While WAR looks at a player’s “average” performance based on his cumulative numbers across the season, a more intricate way to look at how a player has performed in various situations within games is to use win probability added (WPA). This looks at how a player increased or decreased his team’s chance of winning a game based on his offensive contributions, so it accounts for so-called “clutch” situations. While WAR compares players to replacement level, WPA compares a player to average (which would be 0), so its numbers are lower in general. According to Baseball Reference, Pujols has added 58.7 wins above the average player with his offense during his career. That’s the highest total for a player in his first 10 seasons as far back as play-by-play data goes (1950), more than five wins ahead of the player who ranks second, Mickey Mantle. • There is the possibility that Pujols has come up in “higher leverage” situations (e.g. late in close games) more frequently than others, and perhaps that’s a reason his WPA is so high. You can account for this using a statistic called situational wins added, which essentially is WPA adjusted for the leverage of the situations that the player has come up in. This number can be interpreted as wins added above the average player in the same game situations. This makes Pujols’ career look even more amazing, as he has accounted for about 62 situational wins above average over his 10-year career. Not only is that the highest total through a player’s first 10 seasons since 1950, but it already ranks as the 15th-highest career total in that span. For the traditionalists, Pujols has hit at least .300, with 30 home runs and 100 RBIs in each of his 10 seasons. That’s the longest streak of such seasons for a player at any point in his career. Look at the names that are second and third: Lou Gehrig (9, 1929 to 1937) and Babe Ruth (8, 1926 to 1933). That alone should show you the elite company that Pujols can be compared with at this point of his career.